Heavy duty - made from solid steel! Kayak Wall Rack with Straps to properly secure your kayak when it is in storage. This Kayak Rack is built from steel and can hold up to 120lbs. That should hold almost all kayaks out there. This Kayak Racks some with two arms which can be mounted at whatever distance is needed to support your kayak. So if you have a 14ft touring kayak (as long as you have a wall that is 14ft long) this will work. Or if you have a small white water kayak this rack will work as well, just mount the arms closer together. The really nice thing about this kayak rack is that it has integrate straps to tie on your kayak. Being able to securely strap your kayak in while in storage offers piece of mind that kayak is safely store and will not accidentally fall out of the rack and tumble to the floor and get damaged or worse yet fall on someone like your children. This kayak rack features a multi-step rust protection processes which makes this rack suitable for moist areas. You can mount it out on your dock or on your deck/patio overlooking the water. The arms of this rack are wrapped in high density foam which will protect your kayak while it is stored in the rack. How’s it’s going? Andrew from StoreYourBoard.com here to talk to you today about our Kayak Wall Storage Rack. This is a really compact way to store your kayak indoors, perfect for smaller garage spaces, basements, sheds, things like that. You can see the rack on the wall behind me. We’ve got our 10-foot long recreational kayak. This is about 30 inches wide, so the rack can hold some wide kayaks. It can support a variety of lengths of kayaks. All you have to do is change the distance at which you mount the two rack arms apart. Also included with this rack are safety straps, which you can tighten to your kayak if you want. We’ve got them loose in here just so we can show you how it comes out easily. Here’s first strap and here’s the second strap. They’re also adjustable, which is great for different kayaks. Here’s the rack itself. You can see it’s a black finish. It’s made of powder-coated steel. We recommend it for some outdoor use namely in freshwater areas. We have some other more durable outdoor kayak racks for saltwater environments. Some relevant dimensions here. The space that the rack sticks out from the wall is about 22 inches. If you take out the 2 inches back here, the space for your kayak is about 20 inches. There’s a bent piece of metal at the front of the rack that allows you to angle your kayak and rest against that piece to stay securely on your wall. That’s how we had it while the kayak was in the rack. As I pointed out, you can mount these two rack arms at any length that you need to. We’ve also got heavy-duty foam covering the rack arms to protect your kayak from any pressure or distortion while it’s in the rack. This is a great compact option for kayak storage. Check it out on StoreYourBoard.com. Does this kayak wall rack come as a pair, or do I need to buy 2 in order to hang one kayak? This product comes as a pair. It comes with two separate rack pieces that will allow you to securely hang one kayak on the wall. Will this 22 inch rack hold a 34 inch wide kayak? 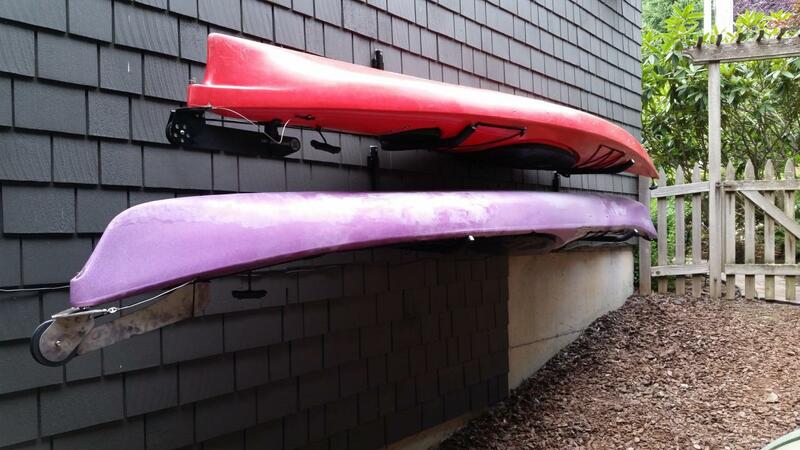 This kayak rack should work for your kayak if you store your kayak at an angle. We have a similar rack to this one that shows a kayak stored that at an angle, for an idea you can see it here. Also, most likely only the center of your kayak is that wide, as the nose and tail are narrower. Could this rack be used for a 40"-wide canoe? A 40" wide canoe would be too big for this kayak rack. We would suggest you take a look at our selection of canoe racks, as these would be better-suited to the shape of a canoe. Will this rack mount on a concrete or cement wall? Our kayak rack should be mountable to a concrete or cement wall with the proper concrete/cement anchors, at the proper weight designation for what the rack will be supporting (the rack itself supports up to 120 pounds, so it will depend in part on the weight of your kayak or board). You can also check out our general installation guidelines for mounting board and boat racks, which includes a short section on drilling into brick, plaster and other materials, as well as some other general tips. Can this product be mounted on a trailers vertical steel rack for hauling kayaks as well? This rack is designed for mounting to a wall, into wall studs. Any other use, such as on a trasnportation trailer, mounting into steel poles, would not be recommended by the manufacturer, and I wouldn't have any reliable specifications for how well that would or could work since its not a recommended use. I have a old town angler dlx model kayak 10-6" will it fit properly on your supports? This kayak wall rack can hold a kayak of almost any length, as you can mount each of the rack arms as far apart as needed to support the length of your kayak -- as long as you have that long of a wall space free for your kayak. So the main things to look at, for whether this will work for your Old Town Angler, is how heavy and how wide your kayak is. The rack can support up to 120 pounds, if mounted to the wall properly, and it can hold a kayak up to about 30" or so wide at its beam/widest part. You also have about 20 inches of rack space where the kayak will be sitting, and then you angle it up against the wall, so one other consideration might be how deep of a kayak that particular model is - if it is a particularly deep model (near or over 20 inches in depth), it may not sit right on this rack. What is the weight of product? This kayak rack has a shipping weight of a little under 7 lbs, which includes packaging, so it should be a little less than that in actual weight. Could this rack be hung on brick? This kayak wall rack includes standard mounting hardware, to mount the rack into standard wall studs. To mount it into concrete or brick, you would need to purchase concrete/masonry anchors, such as TapCons, which can be found anywhere you buy hardware. You would just want to make certain the anchors you purchase are weighted to hold the rack and the load that you would be storing on the wall rack (the rack can support up to 120 lbs, so the anchors would need to support that much weight). Specifically, this Fishing Kayak Rack holds boats up to 34" wide, as well as heavy ones (up to 150 lbs),so should be fine for your Outback, as long as it is no wider than that at its beam, and one you might want to look at. Perfect, exactly what I needed. Simple to install and at the right price ! I purchased 3 of the Kayak Wall Racks, which works well for our Kayaks as well as two Paddle boards that are now neatly stowed on our garage wall. What I like most is the space saving design and foam steel bars and brackets which hold each craft. I mounted my Wall Racks directly into my predrilled studs. Sadly the screws provided didn't hold up to screwing them into the stud. As a result I had to purchase stronger screws. That was the only reason I didn't give this product a higher rating. One other positive was shipping was on time and quick. This product is great quality and was exactly what I was looking for. Some brackets you can buy are just brackets, but this one was specific for kayaks and being specialized made a big difference. We were very happy with the construction and ease of installation with this product. The support straps keep them in place with no fear of falling on the garage floor or worse someone's head. My husband had them installed within 15 minutes! Good quality product. Very easy to install (I screwed into wall studs for maximum support). Just the thing for all shapes and sizes of kayaks. Wall mounts are to light. When came out of the wall when placing the kayak. The dry wall mounts are too light weight for holding heavier fishing kyaks. Had to drill and place in a stud. Beef these up and this would be an excellent product. Bought two of these to put our Elie Sound 100xe's (same boats shown in image above) up in a garage with limited space. 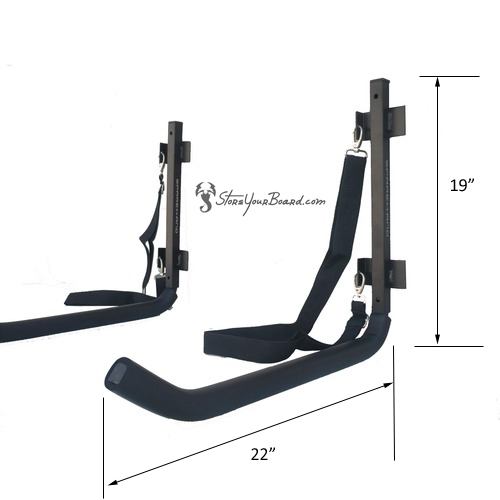 Installed easily in 30min - solid construction and appreciate the extra security of the strap. An excellent way to securely store an expensive kayak. The straps needed to be 6 inches longer to wrap around my larger than usual kayak. The rack itself is great. Product used to hang kayaks on side of house. So far, so good. The racks are very good. Easy to install but would like to have them more resistant to weather and saltwater environment. I already have some rust especially on the screws and welds. The Kayak rack is easy to install, very secure and a good value. Excellent product. Thanks.